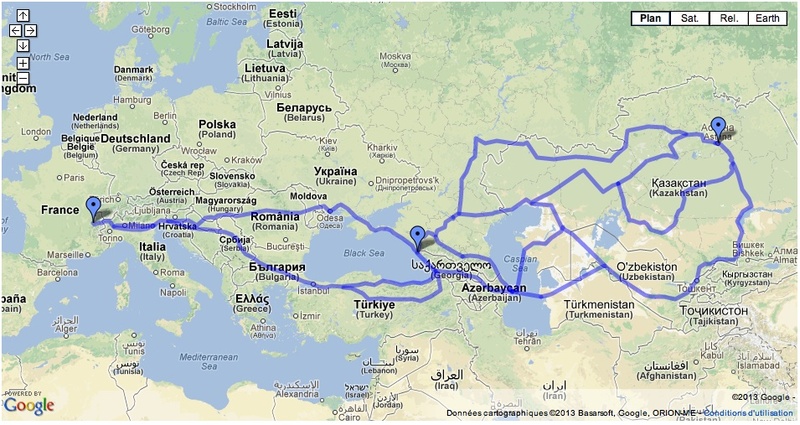 The Sun Trip - a rider, a bicycle, a battery pack, an electric motor, solar panels, and a road trip from France to Kazakhstan. 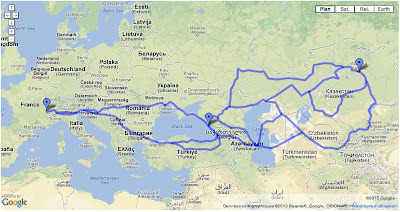 In June 2013 several teams will embark from Chámbery, France with such bicycles, and will finish after many weeks in Astana, Kazakhstan. The idea? To raise awareness of the possibilities of solar powered electric bicycles. The format is part eco-adventure, part advocacy, part bicycling, part solar energy, and part race. It's a normal electric bicycle - that is, a normal bicycle with an electric drive system on it. THe bicycle carries a battery pack, a motor that's usually in the hub of the wheel, a controller, etc. Most of them have a trailer that carries gear and solar panels. 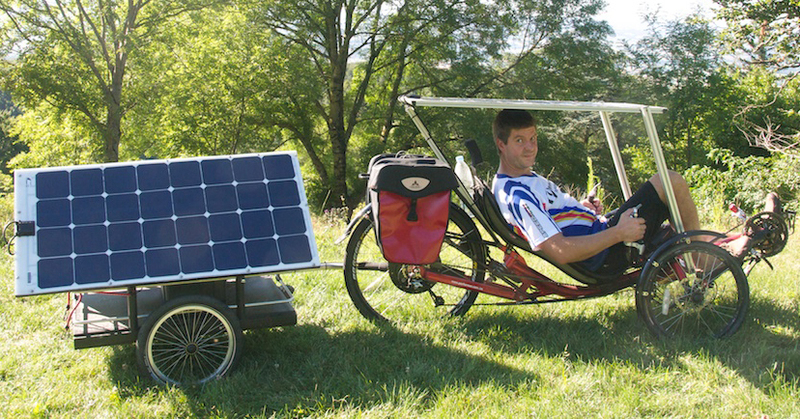 This is a recumbent tadpole trike, with a canopy of solar panels, a trailer carrying gear and more solar panels, and panniers to carry other gear. The motor power is 1000 watts, battery pack is 48 volts 10 amp-hours. That's a small battery pack, typical of what you'd have for around-town riding and in normal conditions would provide 20 miles or so of riding range. The solar panels provide 300 watts (peak) per panel (3 panels, 1.5 kg apiece). Here's a video provided by the organizers to explain it in five minutes. The speaking is in French, but there are plenty of pictures to get an idea. Looks exciting to me. To give a sense for the race, here's a map provided by the organizers showing several routes the teams could take. In actuality each team is free to choose their preferred route. Who can enter? Anybody who can pass a physical exam and can build or buy a qualifying bike/trike. What qualifies? See the pictures above. These aren't terribly hard to build but the organizers say they can help arrange purchase of a bike if necessary. There are two prizes - one is for the first to arrive in Kazakhstan. The other prize is for the one who has the best adventure, and will be judged by the content of their travel blog. Adventurers are required to travel with no outside assistance. They will fund themselves, and may arrange for sponsorships to help cover costs.